The original salad recipe usually calls for iceberg lettuce, breaded chicken, a can of mandarin oranges, maybe some slivered almonds and chow mien noodles, and a dressing of white vinegar, sugar, canola oil, and soy sauce. My version is just as delicious and simple, but with a few tweaks to make it much healthier and clean eating: broccoli and cabbage instead of iceberg lettuce, grilled chicken instead of breaded, extra veggies, cashews for crunch, and fresh plumb slices! 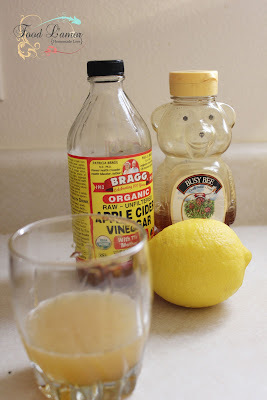 Using apple cider vinegar in place of white adds more health benefits, a little honey for sweetness, and sesame seed oil for amazing flavor without all the over processed risks of canola oil. The homemade sesame dressing has no refined sugar and none of the preservatives that you'll find in store-bought dressings. But even better than that is the Coconut Aminos I used in place of the soy sauce. Coconut Aminos are basically just the sap from the coconut tree, blended with mineral rich sea salt that has been aged. This tasty seasoning gets it's name because of the 17 amino acids, minerals and vitamins naturally found in the ingredients. It tastes a lot like soy sauce and can take the place of soy sauce in most recipes, but is soy free. This is my favorite gluten free, non-GMO, organic brand of Coconut Aminos. Why soy free? First, of all most soy sauces aren't gluten free. They are made by fermenting wheat. Second, soy is one of the most genetically modified and pesticide-riddled plants in the world. If you want to read more, Wellness Mama has a very comprehensive article about the health risks of consuming soy products. Rinse, chop, and prepare all the vegetables for the salad. Toss together in a large bowl. Prepare dressing by adding all the ingredients in a jar, put the lid on, and shake until everything is blended or pulse in a food processor. Pour 3/4 of the dressing over the salad and stir to evenly coat. Cover and set in the fridge to marinade for 10 - 15 minutes while the chicken cooks. Season the chicken with sea salt and pepper and put on the grill. Remove from heat when cooked through (internal temp of 160 - 165 degrees). Once the chicken has cooled slightly, slice with the grain into strips and lay on top of the salad. Drizzle the remaining quarter cup of dressing over the chicken salad and serve.